“What’s the only rule in a gunfight?” Glennon says. “Win the gunfight. There are no rules. That’s it, right?”. The officers nod in agreement. At one point, Glennon asks how many of them have been spat on. Most raise their hands. Glennon runs Calibre Press, one of the country’s largest private police training companies, and this is the start of a two-day seminar, Street Survival, which has been taught to hundreds of thousands of officers over four decades. 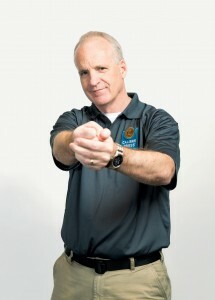 Since buying Calibre Press in 2012, Glennon has expanded its offerings from 35 classes a year to 190, with titles such as Surviving Hidden Weapons, Arresting Communication, and The Bulletproof Warrior, putting Glennon or one of his eight instructors in front of 20,000 officers annually. Every week officers around the country get continuing education from similar classes taught by retired police or active ones. These classes are the conduits through which the profession’s generational knowledge, tactics, and hard-won lessons spread. Like many companies in the business, Calibre promotes a “warrior” mentality for police, likening cops to soldiers and focusing on conflict, vigilance, and martial skills. The purpose of Street Survival, according to the course description, is to “keep officers alive and give them the tools to enjoy a successful career in law enforcement.” In other words, how not to get killed or fired. Heart attacks, suicides, car accidents, and errors of judgment are all discussed, but most pervasive is the sense that an officer unaware of his surroundings is doomed to assault from an unseen threat—that any routine traffic stop can end in a shootout and that the only rational response is to be in a state of lethal alert at all times. How programs such as Street Survival emphasize danger may explain much about how officers meet the public. Outside the classroom, the nation is again transfixed by the issue of police brutality. As class gets under way this morning in June, a cell phone video of a cop pulling his gun on frightened teenagers at a pool party in McKinney, Texas, is going viral. Before proceeding, Glennon points to a threat in the back of the room: me. “In 35 years, we have not allowed the press to come into a class,” he says. “The reason is because we don’t trust them.” He says he’s letting me observe because many police chiefs are frustrated no one is advocating for them. They’re tired of being portrayed in the media as racists and unaccountable killers and want a more sympathetic depiction.